HomeGold IRA BlogGoldWhat Are The Best Ways To Invest In Gold? Why should you invest in gold – and what are your options? Those are the million-dollar questions, right? Investment groups are often asked by clients to provide concrete advice as to which investments are safest, which deliver the best returns, and which are most likely to accomplish the specific financial goals as outlined by the client. The problem is, investments are inherently speculative and there really is no way to lock down the single “best” way to invest. That said, experts the world over tend to agree that gold is a reliable and intelligent investment option. 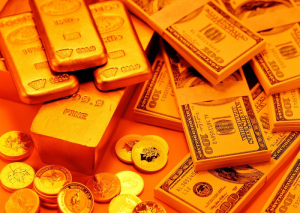 Gold Bullion – This option refers to investing in an actual, physical piece of gold. Gold is generally traded by the Troy ounce, so you’ll have the opportunity to purchase gold in either minted coin form or in bars. Most common bars weigh between 1 troy ounces and 400 troy ounces and the latter would sell for well over $50,000 today. These bars are generally traded by central banks with most individual investors opting for coins. The benefit to this option is you have something tangible to hold. You can keep it onsite or store it in an approved depository (the best idea for most). The only real downside to investing in physical gold is that the trade premiums may be higher than in other gold-related investment options. Gold stocks – Any investment in the stock market carries with it some risk, but gold stocks are often considered a different animal when compared to equities linked to other industries. Gold stocks are an investment in a company that mines gold or is involved in the general production of gold. When gold prices are up and mining activities are strong, these stocks tend to perform well. Conversely, when gold is down there is little incentive for the mining company to either continue to mine or to find other supplies of gold in the ground. Since their costs are fixed, a slight dip in gold prices can have a significant impact on the profitability of a mining group. The benefit? You can make money quickly and aggressively with a gold stock, especially a junior gold stock, but you can also lose a lot in no time at all. This option is best for those who have serious tolerance for risk in their portfolio. Gold IRAs – This option is a terrific path for those who want to self-direct their retirement account and leverage the historical power of gold. A gold IRA enables investors to include precious metals into their retirement account to promote the long-term preservation of wealth. Gold IRAs, and gold in general, offer protection from currency devaluation, financial market instability, and global calamities, and they can be converted to cash or liquidated when entering retirement age. There are several ways to invest in gold. Each has its own level of risk that must be judged according to the goals set forth by the investor. Learn about your investing options from experts in the field when considering the best route to take.